One of the things I especially enjoy about my travels to the Pacific Northwest is the opportunity to check out the music scene when my commitments are completed. This time around, after following Carrie's recommendation over at NPR's Monitor Mix to check out the music of Ladyhawke, I did a 'close listening' of The Magnetic Fields new album Distortion. While they are not from the Pacific Northwest, their music somehow makes good sense in that setting. 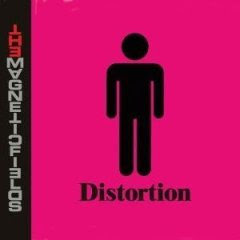 I find that those who like one project by The Magnetic Fields tend to like all of their work. And Distortion has all the elements of a solid new project. The sound is innovative, the literary references are informed, and the presentation is nigh flawless. All in all, an almost pitch-perfect effort. So, if one enjoys identifying literary, philosophical, and pop culture references in music, catchy yet ironic chorus twists, and wise story conclusions, then Distortion will prove to be a good addition to the music library. This 2008 release might just turn out to be one of the best albums of the year. It's substantial, literary, informed, melancholy, celebratory, and form-conscious. In sum, a well-balanced album. Whether it's a track like The Nun's Litany or Please Stop Dancing, this album will keep one wanting to play it over and over again. Thoroughly enjoy and fully recommend. few people make similarly good music. I love the art cover. These guys are truly talented. 69 Love Songs remains a favorite. As well as 'i'. Thanks.